Embarking on a remodel or new house effort is an incredibly exciting experience! Getting started usually begins with visual images, and with the barrage of photographs everywhere around us, collecting images has never been easier – so much so that it can be overwhelming! As architects, it’s our top priority to collect images from our clients that convey their style preferences and personal leanings regarding qualities of interior and exterior spaces. These images guide us continually through our design process. 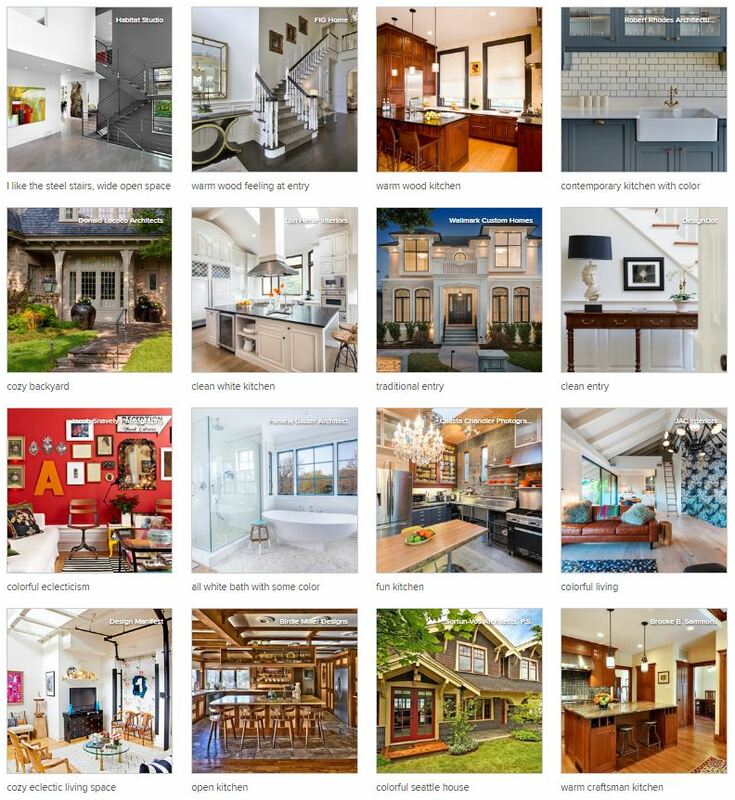 If they haven’t already, we suggest our clients visit www.houzz.com or www.pinterest.com and start assembling files of photos: exteriors, garden spaces, kitchens, bathrooms, living spaces…any photo that captures something that resonates and may be relevant to the project ahead. Its then our job to analyze these images and understand how best they can inform our design work. Frequently, it’s at this stage or even earlier that clients come to us for design advice and services and while it helps us to understand your likes and dislikes, we just can’t put every idea into one house. Creating a cohesive aesthetic throughout the entire house is what we specialize in, and it makes a big difference. A house made with all of the styles, colors and materials from the pictures above would would be very difficult to tie together and it would be even harder to make it feel right. See the next set of images. 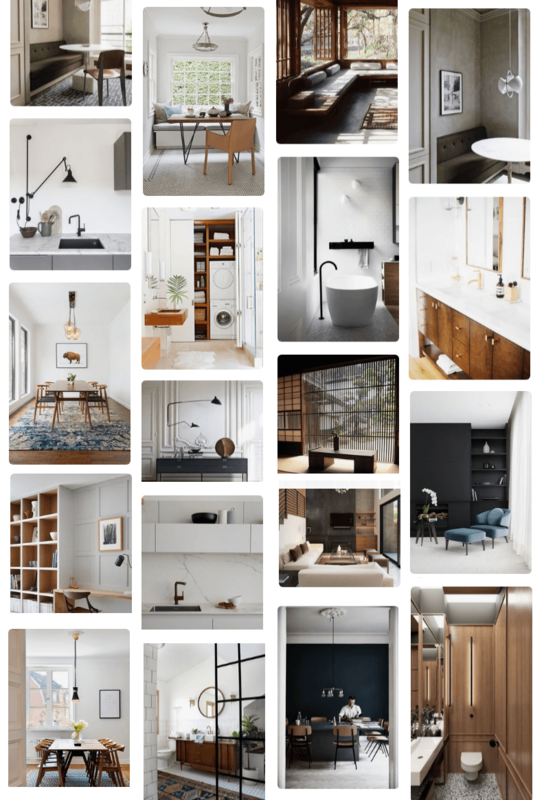 These images were collected by a client during her bathroom remodel, and pared back after a few iterations of “cleansing” her inspiration palette. After looking at her broad selection of images, we were able to pick out several that fit together, and found that certain textures, colors, and materials were consistent with her personal style and her mid-century modern home. This smaller set of images helped inform us as we selected tiles, counters, cabinet materials; they also provided clues for smaller details that helped create continuity throughout other areas in the house. If you answered “YES” to most of these, then keep it in your image selection. If it can’t pass the question test, then put it aside for another time and allow yourself to narrow your selections (you’ll thank yourself later!). One way to self edit your inspiration board is to add descriptions to your photos, or what you like about each photo, and find consistencies. As an example, see the first set of images. Notice similar words like “open, airy, white, clean, contemporary”: most of these photos could work well together. Now look for “warm, cozy, traditional” or “colorful, fun, eclectic”. Your images will be easier to separate into groups (and to narrow down) after you’ve been a bit honest about what draws you to the image. It’s also very helpful for us as we’re looking through your images to know what aspect of the photo appealed to you. Is it the overall quality of light in the room?…or something much more specific, like the layout or style of a kitchen, or the type of window trim?! When you’re not at our side to point out what you like about an image, your images and descriptions will guide our design efforts. It’s our belief that the more information you can supply us with as we embark on this exciting process of designing your home, the more it will be a reflection of YOU!